Russia's hybrid military forces have mounted 13 attacks on Ukrainian army positions in Donbas in the past day, with one Ukrainian soldier reported as wounded in action, the press centre of the Joint Forces Operation (JFO) has reported. "On January 17, the Russian occupation forces violated the cease-fire 13 times ... As a result of the criminal shelling by the Russian occupation forces, one soldier of the JFO was injured," the JFO staff said on Facabook on Friday morning. The enemy employed anti-tank missile systems, automatic grenade launchers, heavy machine guns, and small arms near the village of Pivdenne, as well as 82mm mortars and small arms – near the village of Krymske. 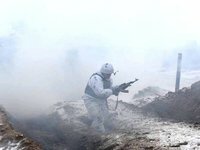 Russian occupation forces opened fire from automatic grenade launchers, grenade launchers of various types, heavy machine guns, and small arms, attacking the defenders of Slavne, Krasnohorivka and Opytne. According to Ukrainian intelligence, on January 17, three militants were killed.